Is anyone worried about America's $19 trillion debt? Virgil Kahl believes America is in "breathtaking" danger: It's deeply in debt. For Kahl, a voter in the critical swing state of Pennsylvania, America's $19 trillion hole is the decisive issue of the election. 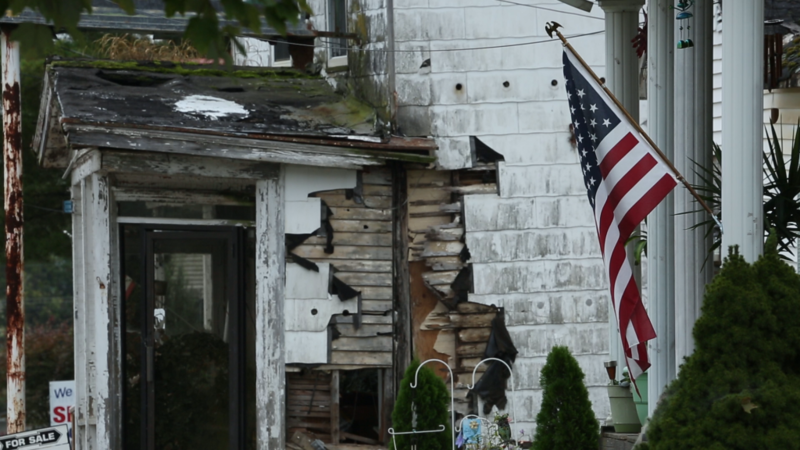 "What's happening with the debt is a real concern," Kahl told CNNMoney at her home about an hour outside Philadelphia. "I don't want us to turn into something like Japan." Kahl was raised in a blue-collar family where money was an obsessive worry. Now she's a successful business owner who lives in a gated community. Until a few weeks ago, she was frustrated at both parties and not planning to vote. "Now I am actually leaning Donald Trump," she says, largely because she thinks his business experience will help the economy. 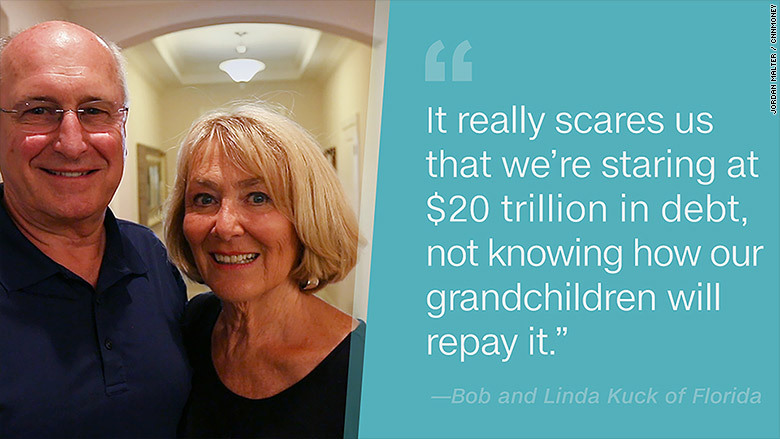 "I think it really scares us that we're staring at $20 trillion in debt, not knowing how our grandchildren will repay it," says Bob Kuck, a retiree living in a gated community in Sarasota, Florida. "I don't think there is any choice but Donald Trump for president at this point," Linda Kuck told CNNMoney. (These swing state interviews will air in a "Your Money, Your Vote" TV special on CNN on October 15 at 7:30pm ET). U.S. debt now stands at over $19 trillion. It was at $10 trillion at the end of President George W. Bush's term. It's nearly doubled under President Obama as the government spent more to try to spur growth after the Great Recession. The debt situation is only expected to get worse in the coming years. Both Trump and Hillary Clinton will increase the debt, according to a thorough analysis of the candidates' plans by the Committee for a Responsible Federal Budget. 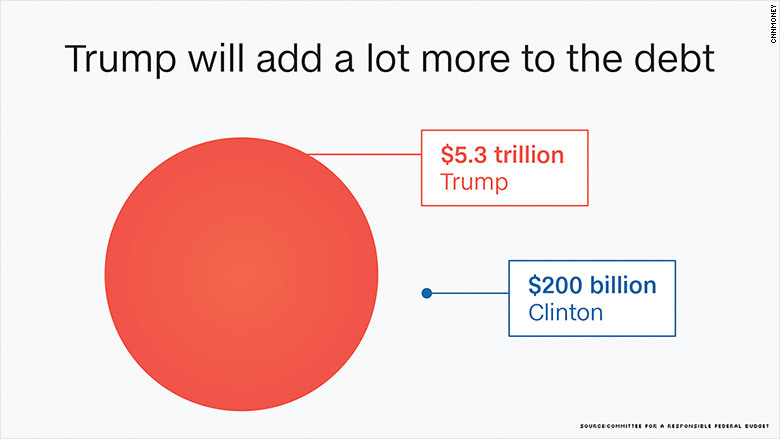 But there's a big difference in how much: Clinton's policies would add $200 billion to the debt over the next decade; Trump's would add a whopping $5.3 trillion, according to the estimates. Trump supporters CNNMoney spoke with who worry about the debt dismiss reports that Trump would add to it substantially. They believe Trump will surround himself with smart people as president and come up with a lower cost plan. "We never have had a perfect president in this country, and we never will," says Bob Stonaker, a retired insurance executive and Trump supporter in Florida. "When I look at his history, he's been a winner." Trump calls himself the "king of debt." He has borrowed heavily from banks over the years for his various property deals, some of which have ended in disaster. On the campaign trail, Trump says he'll balance the books. In April, he even vowed to erase the debt in eight years (a promise he later walked back). But independent, non-partisan groups say his proposals, especially his large tax cuts, would add trillions to the debt. Voters like Dave Young, who plans to cast his ballot for Trump (not enthusiastically), think both candidates are making ridiculous promises on the campaign trail. "I don't agree when either one of them say that they won't touch Social Security. It has to be touched," says Young, who lives in a gated community for retirees in Sarasota. "We're living longer. We have to do something." The U.S. debt is projected to spike after 2025 as Baby Boomers retire and start collecting Social Security and joining Medicare. Experts like those at the CRFB say reforming these programs is necessary, but so far, Trump and Clinton promise not to change anyone's benefits. Voters concerned about the debt told CNNMoney while they have concerns about Trump, they just can't vote for Clinton, even though her husband balanced the budget for several years. The Kucks feel that politicians, including the Clintons, have become "disconnected" from reality. Congressmen and senators make a lot of money, which is why they can't understand what it is takes to pay the bills, like most Americans. It's no wonder politicians in Washington have grossly overspent, Bob Kuck says. CNN's Poppy Harlow, Jordan Malter and Richa Naik contributed to this report.